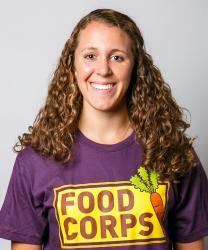 As a FoodCorps service member, I have had the opportunity to work with three schools in the Bronx to engage kids with experiential learning in school gardens, in classrooms, afterschool programs with cooking lessons and in the cafeteria with SchoolFood and taste-tests. It is through these experiences that I daily strive to connect kids to real food and help them grow up healthy. I have always been interested in nutrition, food justice and improving access to healthy foods. 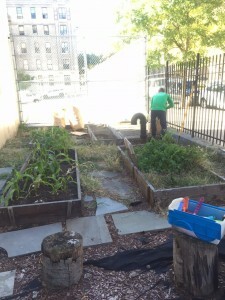 After spending time volunteering in the school gardens and kitchen classrooms of Edible Schoolyard NYC over the past two summers, I was motivated by the importance of engaging kids with growing their own food. Nutrition facts rarely influence a child’s food behavior. They care more about nutrition when they play a part in transforming a seed to a seedling to a mature, nutritious plant that can be harvested and that they themselves can prepare and cook! This is when nutrition comes to life for kids. This is when kids get excited about real food and begin to understand that their food doesn’t magically appear in the supermarket. 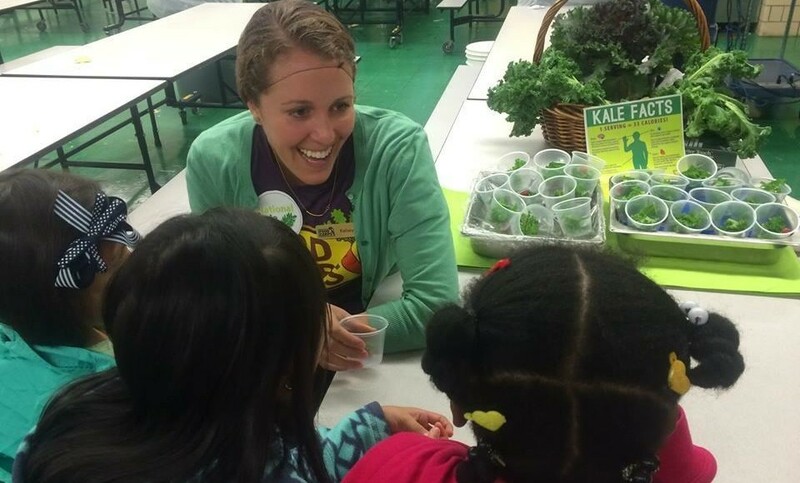 I had the opportunity to witness this first-hand during National Kale Day at PS 294. During lunch, the cafeteria staff and I showcased a potted kale plant. While waiting in line for lunch, the kids held and touched different varieties of kale stems and leaves. Kids were swarming around me to get a chance to touch a kale leaf. “This is a leaf?! And we [can] eat it? !” one of the kids exclaimed. “It feels good, kind of rough and soft all at the same time,” one kid said. The children were so eager to try the kale that they were ripping off pieces of the leaf from the demonstration plant. Kale salad was featured and served on the menu that day and we gave kale salad taste tests to those kids who did not receive it in the lunch line. We talked about ways kale helps our brain, bones, heart and digestive system. There was so much energy for kale in the cafeteria and every kid wanted to give kale a try for the first time! Meanwhile, at The Family School, I have been working with teachers to coordinate garden classes in the beautiful school garden. This past Saturday, I had the opportunity to participate in a New York Cares work day at the school. Along with other volunteers and the champion teacher of the garden, we were able to clean up and beautify the garden. 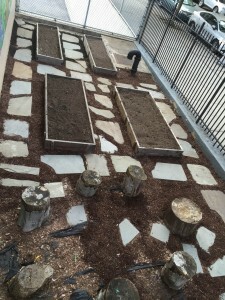 The garden is now ready for students to plant fast-growing crops such as mustards, radishes, arugula, cilantro, and turnips this week before the cold hits. The Family School garden, before and after.